LIDAR has been in use for over 60 years in military, aerospace, robotics, and meteorological fields. Today it is experiencing a flurry of interest due to the expectation that it will be one of the key sensors to enable autonomous driving. 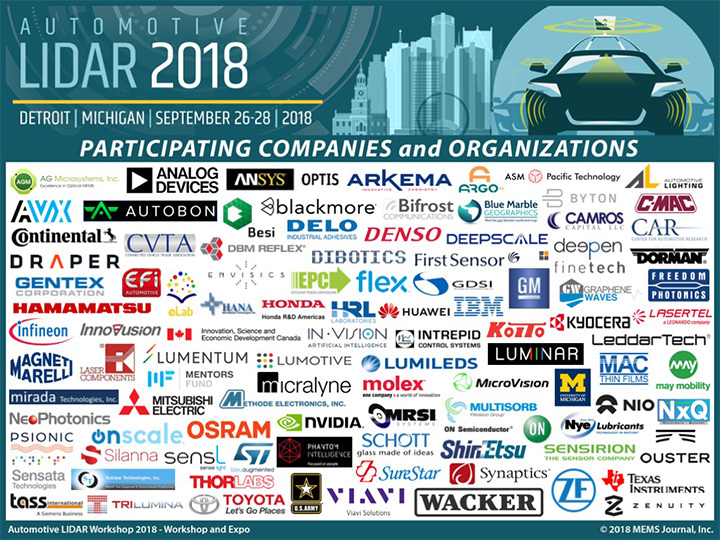 With more than $1.7 billion raised to date, more than 85 companies are developing automotive grade LIDAR sensors using their unique approaches. This conference is the only event in the world exclusively focused on automotive LIDAR technologies and applications. The conference's sessions will describe the various approaches to make a LIDAR system, as well as explain via physics and math the reasons to choose one approach over another. We will also discuss the publicly disclosed methods from each of the known developers, their strengths and weaknesses, and how they likely they are to scale in manufacturability and cost. The conference will also provide overviews of marketplace projections and business trends. The material presented will enable attendees to make well-informed decisions regarding which LIDAR approaches are optimal for solving their challenges and requirements. “The workshop, presentations, discussions and networking opportunities at the Automotive LIDAR conference were very valuable. I believe all the participants, exhibitors and sponsors got our time and money’s worth at the event. I intend to invite my overseas colleagues for participation at next year’s event”.